Hot Toys Iron Spider IS The One-Sixth Figure to Get! 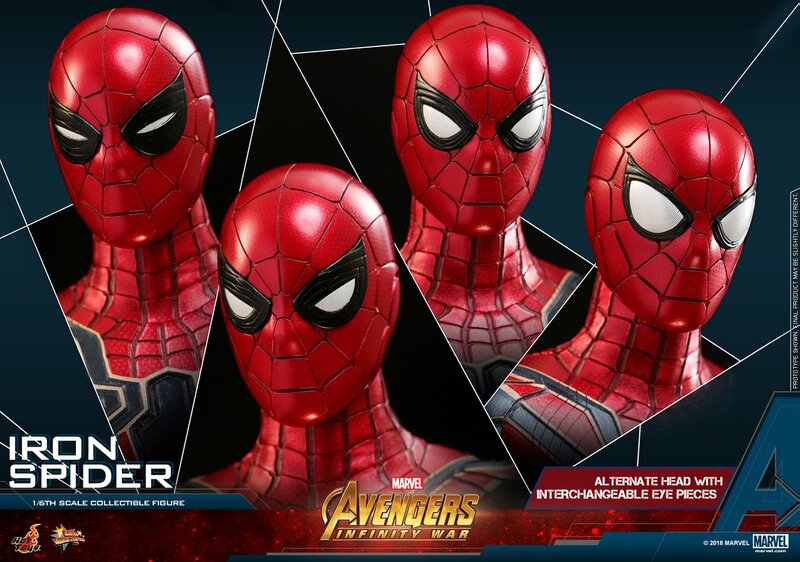 Spider-Man fans have been eagerly anticipating the Iron Spider and if you”ve seen the toy stores here in Manila, its the figure that first disappears in shelves and I’ve come to the conclusion that the upcoming Hot Toys Iron Spider would warrant the same demand when it finally gets released by Hot Toys. 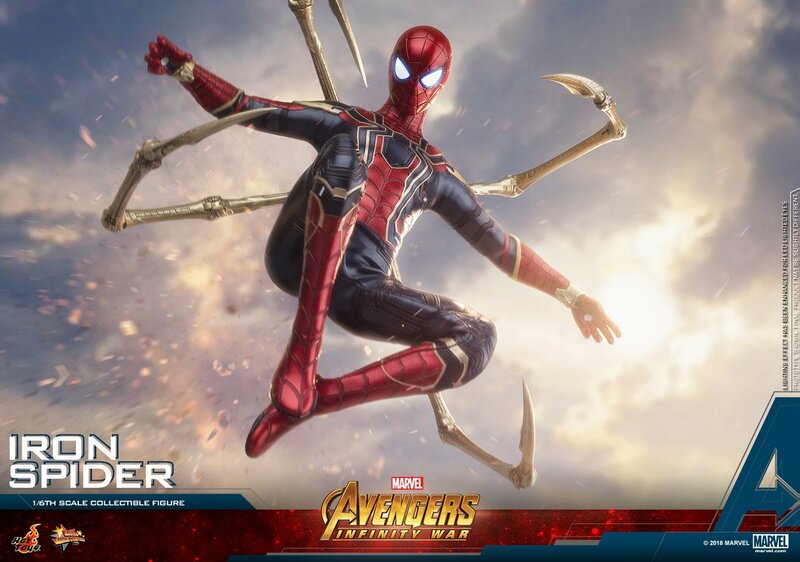 Take a look at the official images released for the Iron Spider below. This changes everything. The whole world has geared up for the upcoming Marvel blockbuster Avengers: Infinity War that arrives in less than one week time. The friendly neighborhood Spider-Man will have to use his wit, strength, and Spider Sense to help the other heroes stop the warlord from enacting his master plan to collect all the powerful Infinity Stones. Being the movie in Marvel Cinematic Universe that has been all leading to, the excitement over this massive battle is at a fever pitch and today Hot Toys is thrilled to present the highly anticipated groundbreaking 1/6th scale Iron Spider Collectible Figure which has received a lot of positive reviews after it made its debut at Avengers: Infinity War exhibition powered by Hot Toys! Designed by Tony Stark, the impressive brand new futuristic Iron Spider Suit has equipped with the latest amazing high-tech weapons. Expertly crafted based on the stylish appearance of Iron Spider with the most up-to-date details in the movie, the collectible figure features three interchangeable heads including a newly developed interchangeable masked head with LED light-up function, a masked head sculpt with four pairs of interchangeable eye pieces to create numerous combinations of Spider-Man’s expressions and a newly painted interchangeable head sculpt featuring remarkable likeness of Tom Holland, a newly developed specialized body, a skillfully tailored metallic red and dark blue-colored Iron Spider suit with gold-colored trims perfectly capturing all the tiniest details, two pairs of articulated Iron Spider pincers with stylish gold-colored painting, a variety of spider-web shooting effect parts and a movie themed dynamic figure stand. Power up your entire Marvel Cinematic Universe collection with this young Spidey in his up-to-date suit from Avengers: Infinity War! Some notable stuff from this Hot Toys Iron Spider. 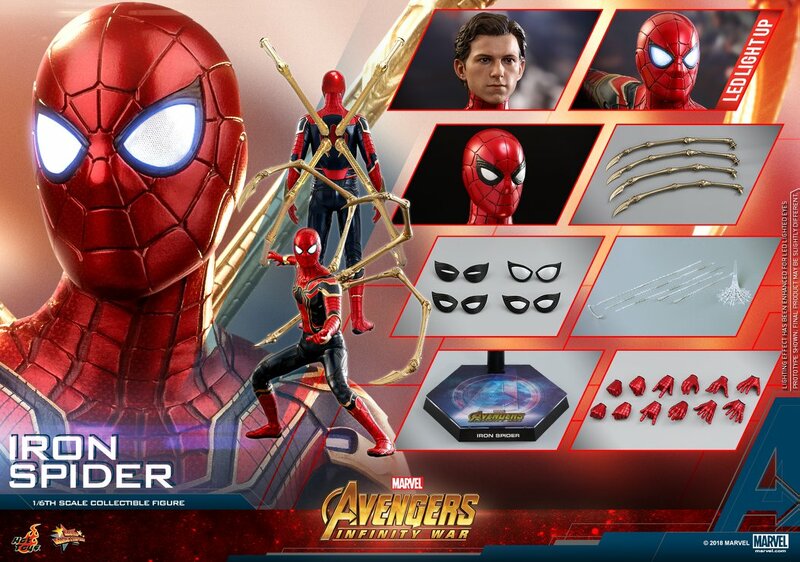 The Hot Toys Avengers Infinity War Iron Spider clearly has A LOT of accessories! 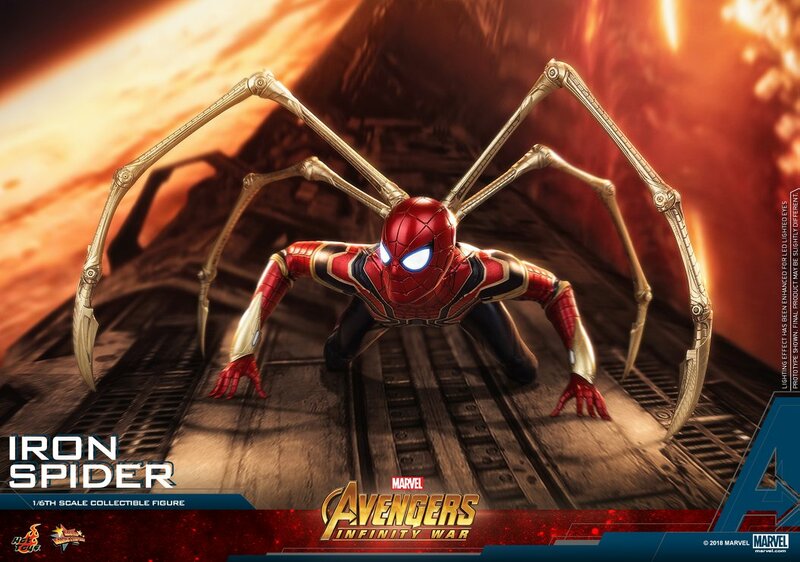 No official release date for the Iron Spider but it is slated for release in between Q1 and Q2 of 2019 and I’d warrant an estimate for the price, I could say this would be around Php 13,000 but don’t quote me on that yet OK? Avengers Infinity War opens April 25 in the Philippines and stars Tom Holland, Robert Downey Jr., Benedict Cumberbatch, Chris Pratt and more.